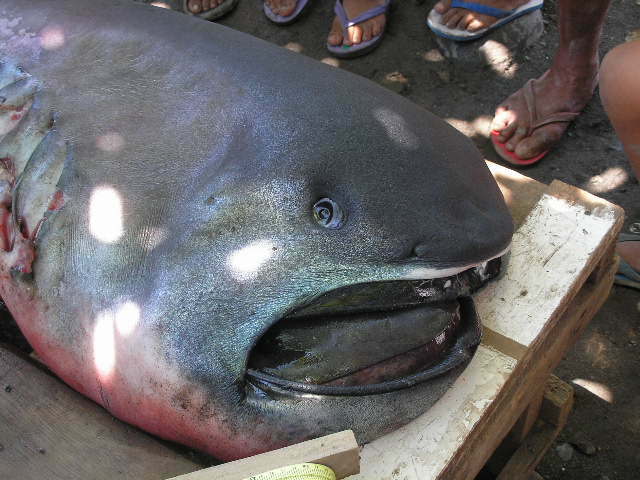 Megamouth shark washes up in Philippines and is only the 60th we’ve ever seen. On the morning of the 28th of January in Barangay Marigondon, Philippines, local residents discovered a mysterious shark washed up on their coastline caught in fishing nets. After contacting local authorities, it was confirmed to be the ever elusive megamouth shark, Megachasma pelagios. This is, by my records, only the 60th confirmed documentation of this enigmatic shark. Whilst detailed information on this species is still lacking, some biological information is known about this shark: check out my 12 brain fondling facts here. But what have we learnt about this shark since its last sighting back in July of 2014. [EDIT]: The original upload of the photo was by Rosalina Sariola of Marine Wildlife Watch of the Philippines (as credited under the photo and hyperlinked). Please see their Facebook page for more videos and photos of the event. All other pictures used are credited to the photographer and also hyperlinked to their source. 85% of sightings have been recorded from the Pacific Ocean with 76% of those occurring in the western North Pacific, off the coast of Japan, Taiwan and the Philippines. A further 5% have been recorded from the Atlantic Ocean and 4% from the Indian Ocean. Caution must be taken though, as fishing effort, fishing gear and local interest varies greatly between ocean basins and may bias distributional knowledge of this species. Distribution of megamouth shark records. Small stars are individual occurrences, larger stars are multiple records with number giving incidences. Taken from Nakaya 2015. It appears that mature individuals are concentrated in northern latitudes all year round with immature, smaller specimens only occurring in warmer southern waters during April and October. Whilst not conclusive, this distributional segregation may be indicative of seasonal/ latitudinal migrations related to reproduction. Geographic segregation by maturity is not uncommon among other large pelagic shark species, so it would not be implausible if the megamouth shark also migrated to warmer waters to reproduce. Further evidence for geographic segregation is supported by the occurrence of individuals with fresh or healing mating scars. These post-mating individuals have only been discovered off Japanese and Philippine coastlines. Although only a small number of individuals (3) have been observed with mating scars, they have been documented throughout the year, which may suggest reproduction is not seasonally limited. We rarely observe any medium sized individuals. They are just not being seen! We either see sharks less than 2.5m or greater than 4m. We still do not know where a large proportion of these sharks spend their time. Are they in deeper waters or maybe in oceanic, non-fishing grounds? We still don’t know and still have no idea! Dissection of limited individuals has enabled us to ascertain a rough estimate of maturity sizes. It appears that males mature at about 4m and females at about 5m. The maturation of females at larger size is common in sharks and is believed to be linked with the high energetic requirements of producing large oocytes and having long gestation periods. Whilst accurate information on capture depth is lacking, from what evidence is available, it appears that the megamouth shark swims at depths of about 200m in the day and then swims to shallower 20m depths during the night. This diel vertical migration is found in other sharks and is typically linked with foraging within localised food resources that also undergo diel vertical migrations. The megamouth shark is quickly becoming one of my favourite species in the animal world. The mystery surrounding it reminds us how much we still have to learn about the natural world. I’m torn though, maybe not knowing about this animal is a good thing. It prevents information on its distribution getting into the hands of those who would happily exploit this creature for some large fish steaks or megamouth burgers. We are still awaiting a full necropsy to be taken from this latest stranding, but any information gathered will be vital in helping us understand this magnificently mysterious megamouth shark in more detail! For more detailed information, please check out the review by Kazuhiro Nakaya out of Hokkaido University, Japan. Lots of medium sized megamouths off the North Wales coast…. That is soo cool!!! How have I not heard of this?! What an amazing thing to read. What an amazing world this place still is. Love the title, made me laugh. A very interesting post as well. Very cool thanks for educating. Nice post you got there. Thanks for sharing another wonder of our mysterious ocean. It looks like Toothless from How To Train Your Dragon. Also I think this is so cool cuz it’s so rare to see them!! WOW! Those were some amazing pictures! Loved your post! Really interesting post. A real eye opener. Man those things look creepy. Fascinating post on this beautiful and rare creature of the deep. Thank you for sharing. Thanks for this amazing story. Love the photos. What a rarity. I’m forever intrigued by the slow evolution of deepwater creatures. Such a neat article, I irrationally enjoy reading about sharks. Great work. Wow, this thing looks so different, just reminded me that there are so many species out there that I’m im the dark about. Wow I’ve never heard of this in the news. A big WHYYYYY? Really interesting update on this story, thanks. This was so fascinating! Amazing story. Thanks, glad you enjoyed reading. Such a fascinating shark!